Since 1975, volunteers of all ages have labored to build and maintain the Pine Mountain Trail, a 23-mile footpath. This main trail and connecting loops, that crosses and follows the beautiful Pine Mountain ridge in west central Georgia, is inside the Franklin Delano Roosevelt State Park near Pine Mountain. The trail and trail association were founded by D. Neal Wickham of Columbus. Quiet woods, sparkling streams, misty waterfalls, rock outcroppings, varied forest, scenic overlooks, deer and turkey await your discovery. Just follow the blazes (6" by 2 ½" rectangles painted on trees). Mileage markers assist the hiker. Wooden location and mileage signs have been placed at each road crossing, trail head, junction, campsite, and at all named parking lots and trailheads. The Pine Mountain Trail offers clear crisp views of distant ridges in winter, with occasional snowfall. In the summer there are lush green ferns and lowland flowers. 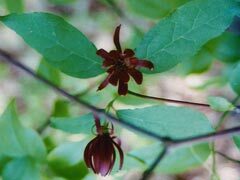 Wild flowers are abundant and in spring you will find flowering dogwood, native azalea, mountain laurel and rhododendron. Fall brings bright and beautiful leaves of hickory, oak, dogwood and maple, which change from day to day. ​Much of the land that the Pine Mountain Trail crosses once belonged to President Franklin D. Roosevelt. His farm was near the site of WJSP-TV. FDR often visited Dowdell Knob and the area of the Wolfden and Cascade Falls as well as the fish hatchery ponds built by the Civilian Conservation Corps in the late 1930’s. On April 12, 1945, Roosevelt died at the Little White House at Warm Springs, less than a mile from the trail and Cascade Falls. On April 12, 2007, the PMTA completed and dedicated a wooden trailhead shelter, sign-in point and trail parking lot at Dowdell Knob which, at 1,395 feet, is the highest point on the trail. On the same day, the Georgia DNR dedicated a new life size statue of FDR depicting him sitting on a car seat overlooking Pine Mountain Valley. The Pine Mountain Trail Association, Inc. (PMTA) was organized to design and build the best trail system possible. D. Neal Wickham was the driving force to establish the PMT and spent countless hours planning, scouting and preparing the land prior to construction. Members and volunteers started working on a weekly schedule, seeking the best route, selecting points of interest and building a safe and functional trail. Until new trails could be built, old existing horse trails and Boy Scout trails were used as temporary connecting paths. Miles of trail were obtained in this way but it took years of rerouting and work to get the final route. The result: a trail designed for maximum enjoyment with many points of interest and few steep, tiring grades. After working in winter’s freezing temperatures and summer's sweltering heat, a 23-mile, blue-blazed trail was opened from the FDR park entrance (near the Country Store at US 27 and Georgia 190) past Dowdell Knob and on to the WJSP-TV tower near Warm Springs. Less than two miles remain of the old trail. The Pine Mountain Trail Association appreciates the cooperation and the continuing efforts of the management and staff of FDR State Park. Registries at the eastern end of the trail, Dowdell Knob Trailhead and near the FDR Park office have been signed by tens of thousands of hikers from every state and many foreign countries. It is estimated that 60,000 hikers use the trail each year and over 1 million hikers had hiked all or part of the trail by 1995. The trail is for foot travel only. Horses and wheeled vehicles are strictly forbidden. In addition to the 23-mile main trail there are seven loops formed by connecting trails. In 2006, Pine Mountain Trail Association volunteers started and completed the last addition : the 2.4 mile White Candle Trail section, which combined with the Beaver Pond Trail forms the newest loop, the 3.4 mile East End Loop. Near GA 190, the White Candle Trail passes through a section of old long leaf pines that FDR had planted in 1930. A historical marker nearby on GA 190 tells about the area. Sixteen designated back-country/backpacking campsites are at various places a short distance off the trails. Use if by permit only. FDR State Park does not charge PMTA members who present their membership card for the required permits to backcountry camp on the trail. The Pine Mountain Trail is within FDR State Park. FDR, like all state parks requires a daily use fee for parking anywhere within the park. Annual Georgia Park Passes are good at all state parks such as FDR. Contact the FDR park office for all fee/permit rates and other information by calling 706-663-4858. Parking Permits are available throughout the park at Self Pay boxes. The FDR State Park office is open 8:00 a.m. - 5:00 p.m. Monday-Thursday, 8:00 a.m. - 8:00 p.m. on Friday, and 8:00 a.m. - 6:00 p.m. on Saturday and Sunday, and sells Pine Mountain Trail maps.